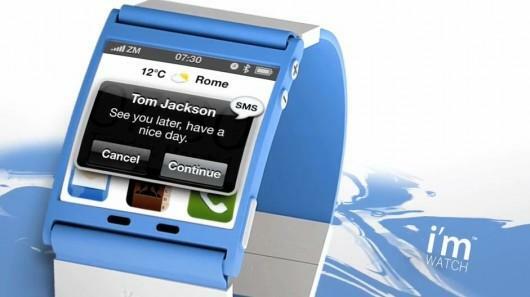 A few steps up from the LunaTik iPod watch conversion kit, Milan based Blue Sky s.r.l. 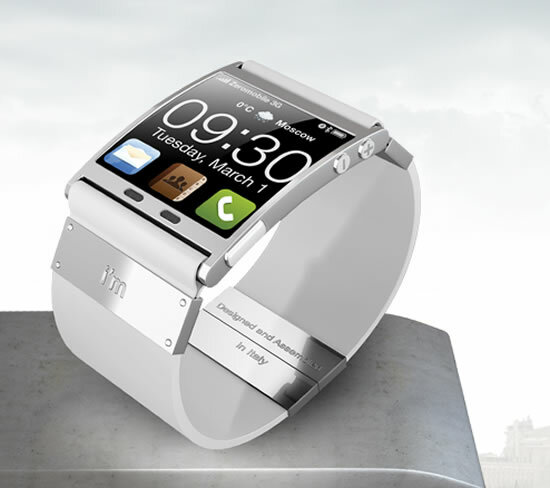 is about to release the “I’m Watch”, promoted as the world’s first smartwatch. Designed with Android-based phones in mind, but apple (Blackberry to follow) compatible as well, it connects to your device via Bluetooth. The smartwatch is divided into two distinct production lines, the more expensive “I’m Jewel” and the (still not inexpensive) “I’m Color”. Priced between US$840 and US$16,833, the “luxe” version will be available in white gold, pink gold, yellow gold, black gold or titanium finish with encrusted diamonds. The “I’m Color” collection will be more basic, available in white, blue, green, yellow, red, pink and black, and priced at US$349. Basically an Android device/ accessory, the “I’m Watch” can make and receive calls, text messages and e-mails, and has a speakerphone for calls. It has a touch screen interface and comes with access to Facebook, Twitter and Foursquare, with additional apps to be made available through the “I’m Store” and music via “I’music”. Technical specifications are – 1.54” 240×240 pixel color TFT display, 4GB built-in storage, 64MB RAM, Bluetooth 2.1 + EDR support, Li-Po 600 mAh battery. If you can stagger your way past the rather unfortunate name of this device, who will it appeal to? Well with regards to the “I’m Color” collection, gadget fans is my guess, though there may be a crossover with those watchnerds who got a Lunatik. As for their eyebrow-raisingly priced luxury range, your guess is as good as mine as to how many they’ll sell. For US$16,8333 (or even US$840) I can think of a lot of other watches or gadgets I’d rather get for that sort of outlay. You can find out more and pre-order the “I’m Watch” from their website but meanwhile, here’s a short clip from the brand.